I just finished Apollo Justice: Ace Attorney, which follows the original Phoenix Wright trilogy (which I review here). 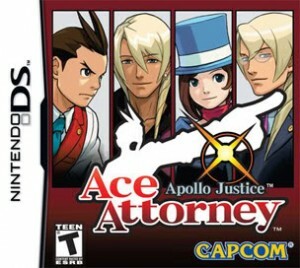 I can’t think of another game franchise of which I have finished four entries, so something about the Ace Attorney series must really appeal to me. 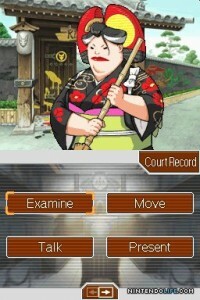 In all of the games, you play a lawyer who has to gather testimony and evidence in really goofy murder cases. Then you find yourself in court, defending your client by pointing out contradictions in testimonies and presenting evidence. You’re invariably assisted in court by a young protégée with some kind of convoluted back-story. In fact, all the characters come with a capital C, have a troubled past, sport outlandish outfits and have eccentric personalities. 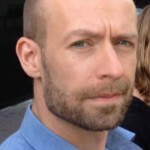 Somehow the cases often have a connection, however tenuous, to either your alter-ego, your crew or to the prosecutor you’re up against. The emotional stakes are high. Over the course of the four games, not a whole lot has changed. 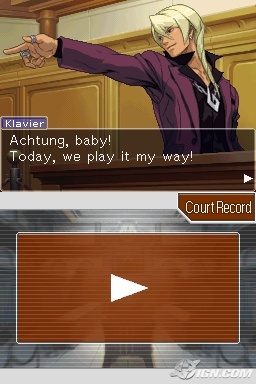 For this entry, Phoenix Wright has been pushed to the background in favor of Apollo Justice, but when it comes to gameplay and dialogue, you’ll barely notice the difference. There is a new feature where you use Apollo’s skill at reading body language to spot when someone is lying while giving testimony. Unfortunately, this new element is more frustrating than fun, as you can’t see all of the witness when in the special ‘spot the lie’ mode and have to zoom around their face and upper body. As the clues are subtle, you will find yourself having to go through the same bits of testimony a few times, which gets old fast. Repetition in general is a failing of the franchise. You’ll be hearing repeated dialogue when backtracking or presenting irrelevant evidence to people, which is hard to entirely avoid. There are also a lot of recycled locations and limited (though charming) repeated character animations. 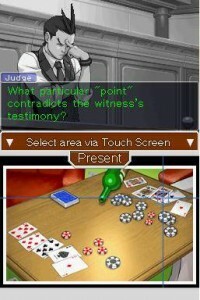 Another problem is that – as in previous games – your alter-ego may go off on a tangent and make a brilliant deduction that never occurred to you, or vice versa, refuse to understand what you’re trying to bring across because you didn’t present the only ‘correct’ piece of evidence at the exact point in the testimony that the game demands. Even when there seems to be more than one option. Perhaps the most wearing, though, is the slow pace of the games. The dialogue is half the fun, but there is a LOT of it and you can’t speed-read through it. It types itself out like you’re watching someone speak it. I understand this is a conscious decision to make the experience more cinematic and also to keep people from inadvertently missing important clues, but it does make you feel that you’re driving with the brake on. It doesn’t help that you’ll almost always have to press for more information on all parts of someone’s testimony, because you can’t be sure where the big revelation is hiding. The resulting exchanges are often funny, but cause further slow-down. The slow pace made me drop out of the game midway about a year ago, but once I picked it back up, it managed to hook me again until the finish-line. So why do I keep playing these draggy, repetitive games? Well, they’re like comfort food. They take place in a zany universe that’s relaxing to hang out in, with sympathetic, funny characters, and some genuine tragedy thrown in, to pluck at your heartstrings. And it is very satisfying when you do manage to make the odd leaps of logic the game demands, and ultimately get a ‘not guilty’ verdict for your client. Apollo Justice is more of the same, with an overarching plot that ties together most of its separate cases neatly in the end. Not believably, mind you, and the word ‘convoluted’ doesn’t even begin to describe how the writers contort the narrative. But the ending is emotionally satisfying nonetheless. Further entries in the franchise are Phoenix Wright: Ace Attorney – Dual Destinies (available as a download on the 3DS) and Professor Layton vs. Phoenix Wright: Ace Attorney (also 3DS, coming march 2014). I probably should have taken a break to avoid an overload, but have already started on Dual Destinies and it does have some interesting (though mostly cosmetic) improvements. I’ll follow up when I finish it.